Products communicate with Shared services though a common API which allows all the products to employ true single sign-on between the products. Corporate External Authentication (optional). Your (already existing) corporate external authentication mechanism. If you do not have a corporate external authentication provider you can use the provided Native Directory to create users and passwords to provision. However, doing this puts you into the password and account maintenance business. If you do have one, you will want to use it, as that will be taken care of for you. Shared Services will not store passwords of externally authenticated users, it simply forwards on the ID/Password combination to the provider for a thumbs-up or thumbs-down. 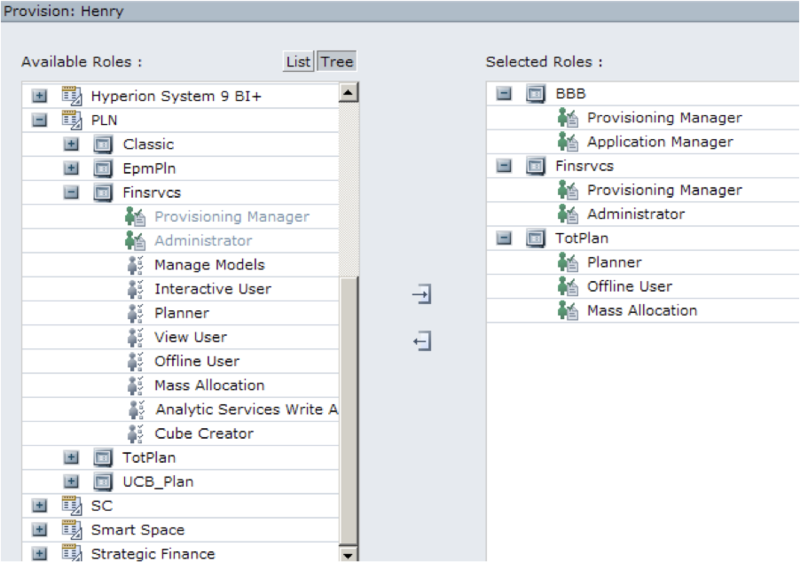 You can have multiple user directories configured and set a search order for them. The Native directory holds user IDs and Passwords of Natively authenticated users, provisioning information for all users, and tracks user-group relationships. Again, this is stored in the OpenLDAP repository that comes with Shared Services. The OpenLDAP that comes with HSS is a simple file-based database that is in LDAP format which runs on port 58089. You can actually use an LDAP browser and connect to OpenLDAP and browse around using a base DN of dc=css,dc=hyperion,dc=com. The relational component is a separate database (or schema in Oracle) that holds registration information about the products in the environment. The following diagram summarizes the components. Again, the corporate LDAP authenticates the user (are they who they say they are), the relational holds product registration information (can they access this particular product), and the native directory handles authorization (do they have permission to do what they are requesting to do in this product). The User Management console using the URL http://<server&gt;:58080/interop is used to provision users. Provisioning is the process of granting access to users to certain products and services. Here we browse through the users, and provision Henry for the BBB Essbase Application and the Finsrvs FDM application, and the TotPlan Planning Application. The product queries all the configured user directories to verify the credentials. Upon success, the user is authenticated. Once authenticated, the product contacts Shared Services to lookup the provisioning information of the user to see if the user has been given the access to the product and service. 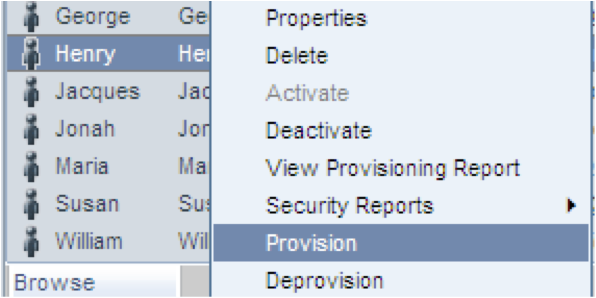 SSO is enabled for this user now for the rest of the products they are provisioned for. Shared Services is a single point of failure for all Hyperion Products. ~ by Eric Helmer on October 10, 2008. When I cinfigured HSS with the MSAD, everything went well. I am able to search all the user with their names. When configuring the external authentication in Shared Services, the “ID Attribute” field should be populated with the MSAD attribute used for the user logins. With MSAD, most commonly this is sAMAccoutName, however, it can be set to anything. Change that, restart Shared Services, and that should work. Nice EPM blog. Looking forward to read more. The HSS User Management Console is obviously not designed by an administrator. Since most applications use hierarchies in their metadata structures, the limitations on displaying and reporting security rights is lacking big time. I know of a couple of companies that have developed their own MS Access tool to maintain the user security rights and updating HSS by upload files (HSS and Application specific). Oracle should take this seriously and use OBIEE to display group relations and access rights to Security Classes in one combined view – Maybe even like a focused Mindmap as used in Infor PM Financial Consolidation (not the security part). Even more important is the lack of support for Matrix Organisations when it comes to security – The multi-user-account approach is not compliant to SOX, so Oracle should stand up to their responsibility and make at least HFM fully SOX compliant. Most enterprises uses some sort of matrix organisation so it is a growing problem. Eric, do you know of any commercial products that are available to help administrators of System 9/11 in regard to user security maintenance? Nice article, I have configured MSAD as user directory and it works fine, I need to configure SSO, so it can authenticate using the MSAD, can you please thow me some light on this, I have been reading the documents, but still I am not able to understand which way I have to go, should I extend the api to pass the user name and password or can it be done just through configuration. You advise would be really helpful. REALLY ………THIS ARTICLE IS AWESOME…………! Really very fantastic article on HSS. I got the clear idea. Thank you so much to the author.